I have convinced myself that Addie’s inability to color outside the lines will somehow serve her well later in life. On Saturday I colored Strawberry Shortcake blue with orange hair and I could see her tiny frame vibrating with forced acceptance of my creativity. 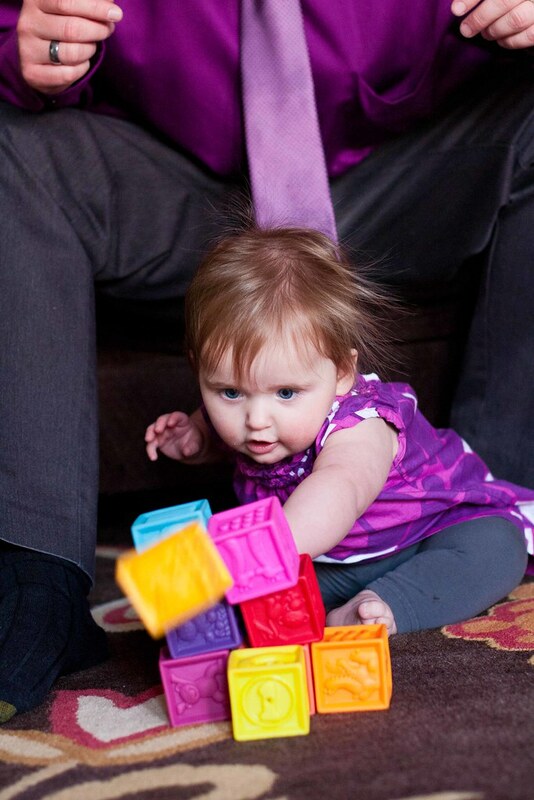 Vivi on the other hand sees a pile of neatly stacked blocks and sets out to destroy them by any and all means possible. In my head Addie is still this tiny little toddler. Then I see her scratchy marks on the wall or confuse a pair of her leggings for a pair of my capris and I’m left befuddled that something that came out of me could have ever ended up so huge. 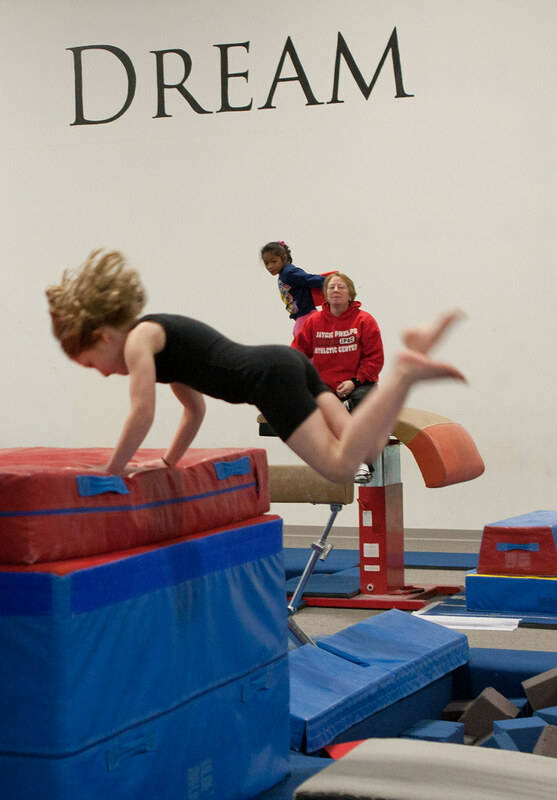 She’s been taking gymnastics for almost two months, she spent two full days at her gym over winter break doing nothing but running around, jumping off and flipping over stuff. She’s convinced our backyard is the perfect size to build our own gymnastics gym and that we should get on that pronto. She gets frustrated when she sees the bigger girls flipping and tumbling with ease while she’s left working out the finer points of a cartwheel and backbend. Addie? If you could see how far you’ve come, how much you’ve improved and how much you’ve learned in seven short weeks? You’d realize that flipping and tumbling isn’t that far off for you. I can’t wait for you to see the Summer Olympics this year…those girls are going to blow your mind. Then I’m going to tell you that the girl who owns your gym once went to the Olympics and won a few gold medals of her own. Someday you’ll meet her, maybe even see her medals and realize that yes, girls from Indiana can and do go to the Olympics and yes, you could very well be one of them. @Adventures In Babywearing, It’s so her thing, sparkly outfits and crap to bounce off of. She’ll get there in no time. A great dream, for sure. @C @ Kid Things, Unless she ends up way too tall, which right now seems totally possible. Onto Ballet! Oh my gosh I love hearing about people getting their children involved in gymnastics! I live in Indianapolis & coach gymnastics in Carmel and did gymnastics for 10 years myself growing up. I had the chance to meet Jaycie Phelps at the Fashion Mall in ’96 and she was my idol! @Rhona, We hemmed and hawed for a long time deciding what to get her involved in and one day it was obvious that gymnastics was totally it. So sweet. My wee one started gymnastics last week. There was much yelling and grouching (at the older “team” kids) not sure if we are at the right gym…does that happen at yours? @Shannonannon, By the coaches? There is one coach that is very serious but I wouldn’t say grouchy. Addie’s coach is fantastic and kind. I love that you recognize the differences in your girls. And that you celebrate them. Oh, and these pictures. duh. @Brittany, They are SO different. SO SO SO. Great sport! I am glad to see that Addie found a sports passion. @Jenny, Dude, me too, she’s so happy. Just saw your comment re: tree and lights. Haha! I was motivated! My mom comes over to watch my son during the week. I didn’t want her to take it down and then I’d feel like a failure. Plus, when you’ve been failing the same dang test for 5 years, you have to find something to take control of and conquer. Leave up your decorations and turn them on! Count yourself first in the neighborhood, counting down the days until Christmas 2012. ;). Then sit back and snuggle your girls. They are too cute! The little one is going to give you a run for your money! I love your blog, your girls and your outlook on life. I’m addicted now. Thanks for sharing your life with the world! We’ve made our backyard into an ice rink for our budding stars. Truthfully though..I use it mainly to practice my toe flips when the kids are sleeping. Don’t tell. You colored Strawberry’s hair blue? That makes me a little twitchy. How amazing to watch your daughter grow into her dreams. So much like my girls, seriously. Maggie: perfectionist, bossy when we color. Audrey: KNOCK IT ALL DOWN AND MESS IT ALL UP WOOOOOOO!!! !